﻿- Son of Mr. and Mrs. C. S. Pricer, is 21 years old and was born December 9, 1918 in Perry. He has always attended the Perry schools. For four years, he has played the position of tackle on the Perry high school football team, was co-captain in 1939; a member of the all-state team and all-northern teams and won a football jacket. 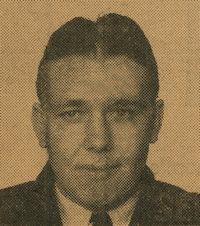 In 1936-37 he played center on the high school basketball team; in 1938 he was a member of the wrestling squad and in 1937 he was a member of the track team. He has served as vice-president of his home room class. Eli plans to attend college some place next year. ﻿Eli Harold Pricer, 80, served in the U.S. Army, 45th Infantry, Company C, on; 645 tank destroyer. He earned the rank of Staff Sergeant and saw action in Naples, Foggia, Rome, Arno, Rhineland, Central Europe and North Africa. While “in the army Pricer earned the American Defense Service ribbon, EAME Service ribbon, Silver Star, Purple Heart and Good, Conduct Medal. He was a custodian for the U.S. Postal Service, served on the Perry Police force from 1946-1949 and was a custodian for the Perry High School. Pricer was born December 9, 1918 in Perry, to Charles and Eliza (Haskell) Pricer. Pricer died at 6:35 p.m. Thursday, April 29,1999; at Integris Health Baptist Medical Center in Oklahoma City. He married Maxine Passow on January 1, 1945 in Perry. Funeral services will be held at 10 a.m. Saturday, May 1, 1999. Rev. Lynn Scott will officiate. Interment will follow at the Grace Hill Cemetery in Perry, under the direction of Brown-Sisson Funeral Home. Pricer was preceded in death by his wife, Maxine; one son, Eli Pricer, Jr.; his parents; seven brothers; and one sister. He is survived by a son, David Pricer, Perry; a grandson, Mike Pricer, Perry; and a number of nieces and nephews.